UKL provides both commercial and domestic clients with quick, cost-effective methods for removing Japanese knotweed. We also offer advice, control strategies, licence applications, management plans, monitoring, supervision and training. Japanese Knotweed is a fast growing plant which can cause serious problems by displacing natural fauna and causing structural damage. It has the ability to grow rapidly and spread quickly displacing other natural fauna. Its extensive rhizome system allows new shoots to be produced from any part of its rooting system, with a 1 metre square capable of producing as many as 238 new shoots. 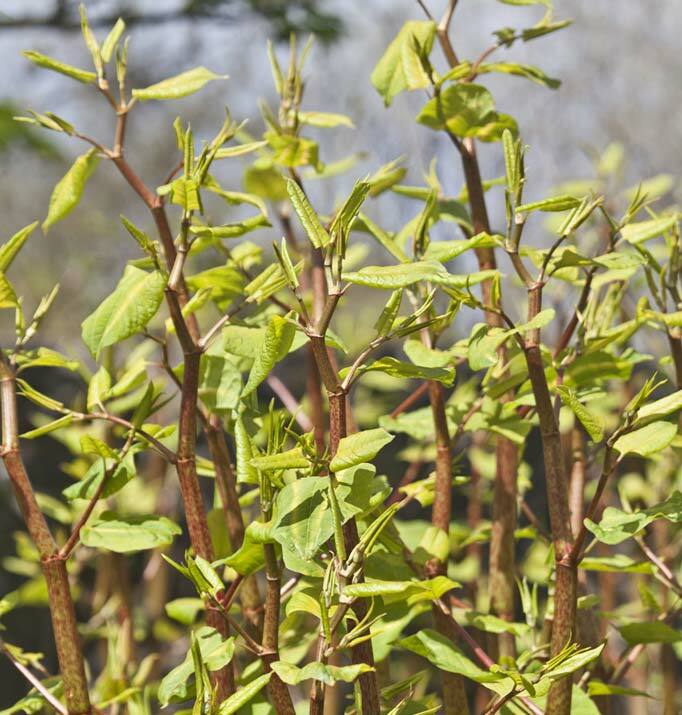 Although it is not against the law for landowners to have Japanese Knotweed on your land, if it can be shown that the plant has spread onto neighbouring land, you could be deemed responsible for any damage caused. The Wildlife and Countryside Act 1981 and Environmental Protection Act detail a ‘duty of care’ and offences under these acts are prosecutable. As Japanese knotweed is a perennial plant, its appearance changes with the seasons. In the early spring, shoots appear with reddish purple leaves. As the plant grows – up to 10cm a day – the stem elongates and develops purple specks, similar to that of bamboo, and the leaves unfurl and turn green. They have a flattened base and a pointed tip and are arranged on the stems in a zig-zag pattern. By early summer, the plant is fully grown and reaches up to 2 – 3 metres in height. By late summer (September/October), it produces clusters of creamy white flowers. During the winter, the leaves fall and the stems turn an orange/brown colour. Stem and leaf material decompose slowly, covering the ground with dense plant litter. During March/April, the plant sends up new shoots which thrive on the stored nutrients and grow rapidly, repeating the seasonal cycle. We are dedicated to the professional treatment of Japanese Knotweed as our commitment extends to the offer of free advice. If you have any queries regarding invasive weeds then please contact us by phone on 01606 841080 or use the contact form on this website. Complete a Site Survey to determine the extent of the infestation. We will look at timeframes, environmental features (e.g. proximity to structures), future plans for the site, hazards/risks (e.g chemical contamination). Produce a Management Plan detailing the treatment options available. This will include a variety of treatments, timescales and associated prices. Complete Licence Applications so treatment can progress. Begin treatment/eradication as agreed in the Management Plan. Dispose of the waste material which is classed as controlled waste at a licensed waste facility and with the appropriate Waste Transfer documentation. Undertake monitoring using rhizome sampling and testing to ensure eradication has taken place.